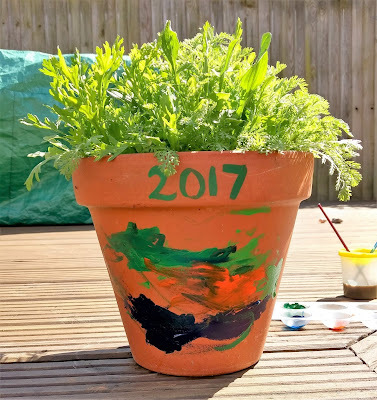 When the sun shines but you fancy a bit of painting why not paint some plant pots? Who cares if they're old and are already planted up? The acrylics dried up super quickly mind you - I gave up using a palette in the end and just squirted straight from tube to brush! Jessica added some lovely colour to her pot that she's growing wild flowers in. As you can see, she was a little heavy handed with the seed so we'll just have to wait and see if anything manages to flower! 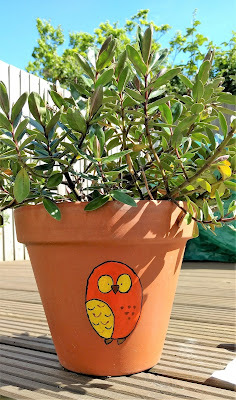 I chose to decorate my Hebe pot with a cute little owl. Twit-twoo!